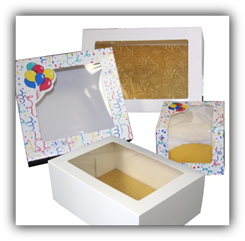 Enjay Window Boxes come in bright white or decorated with balloons and confetti. Both have the option of coming with a gold double wall cake board. 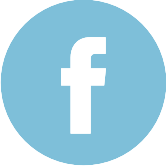 These boxes range fro .016 - .020 caliper SBS. 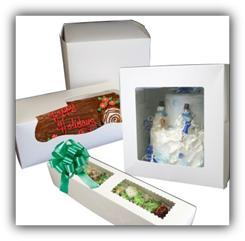 These boxes also have a large poly window for product display and they are freezer/refrigerator friendly. Solid bleached sulfate (SBS) window boxes are made with .016 - .022 (pending on box size) caliper SBS. 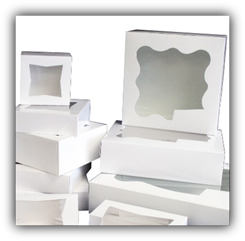 These boxes have a large poly window for product display, and they are freezer/refrigerator friendly. 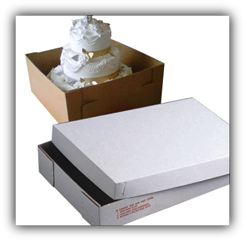 Specialty Cake Boxes are made of high quality SBS. Some boxes are available with a poly window. 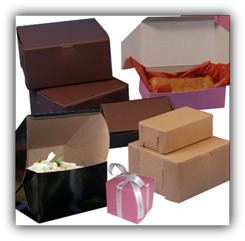 These boxes are perfect for tall cakes, log cakes, gingerbread houses, tiered cakes, doll cakes, and a bouquet of roses. 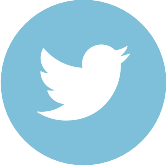 Our non-window boxes are made of either SBS, polyboard, MCS, and vrigin kraft. These boxes are versatile, both for cakes and pastries. They can be easily customized. 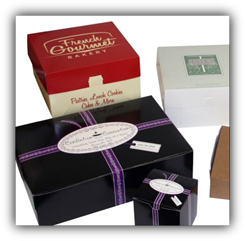 Our Decorated Cake Boxes are made of high quality SBS and are grease resistant and retain aroma. These boxes are Unger's own delhi-lock style for a clean exterior look. They come in our "Bakery" trimline design, and our Rhapsody design. The Rhapsody design is available in pink/burgundy and green/red color combinations. The large poly window allows for freezer applications and an impulse purchase. 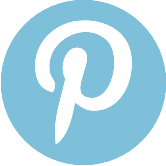 Click here for our Promo Printing Program. 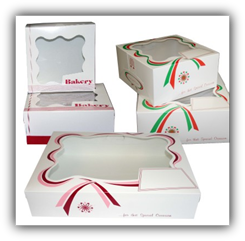 Window bakery boxes are available in White (SBS), Chocolate, Strawberry, or Kraft. These boxes have a scalloped window, some of which have a waterfall window for more product visibility. Non-Window bakery boxes are available in Chocolate, Strawberry, or Kraft. 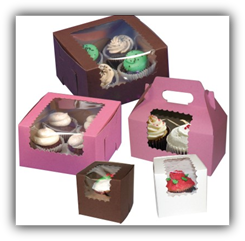 These boxes are versatile for cupcakes, cakes, and other pastries. 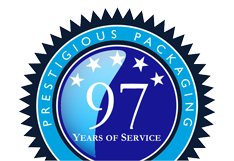 Click here for a Custom Corrugated Box. 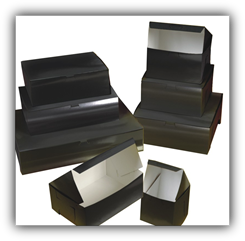 Non-Window black "licorice" SBS bakery boxes are versatile for cupcakes, cakes, and other pastries.